Income from retirement annuities remains 7% lower for people that remain invested just before they take their benefits after significant falls in equity markets and gilt yields as concerns over economic growth worry investors. 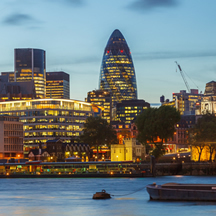 The UK FTSE-100 index has reduced 464 points to 6,388 after investor concern over economic growth in the US, Europe and across the world. 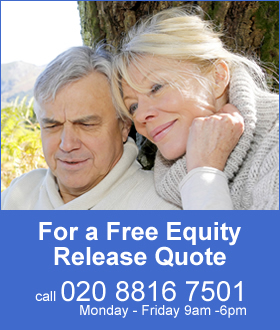 For people with pension funds that remain invested before they take their benefits and track the FTSE index it means their fund will be lower by 6.7% and further drops in annuity rates means their income is now more than 7% lower. Poor economic data from the US with falling demand started the sell-off in equities. This was followed by news that Greece would exit their bailout programme, China had weaker than expected inflation data and Germany in economic slowdown all contributed to the falls. Annuity rates are based on the 15-year gilt yields and during the month these reduced by 36 basis to a new low for the year of 2.42% before recovering. Yields had improved to a recent high of 3.47% after reaching an all time low of 2.02% in August 2012. 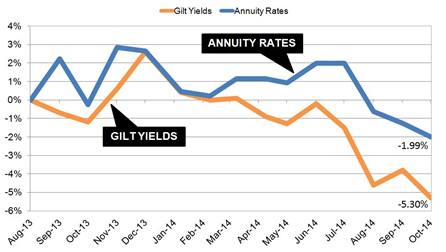 The following chart shows how annuities are now lower than they were last year. Over the last 14 months, yields have reduced 53 basis points and as a general rule this would mean annuities would reduce by 5.3%. Currently the annuity rates are lower by 1.99% suggesting a further fall of 3.31% is possible in the medium term if yields do not recover. For our benchmark example for a person aged 65 with a fund of £100,000 could have purchased a single life, level annuity with an income of £5,948 pa and this has now reduced by £464 pa to £5,484 pa, mainly due to a fall in equity markets. In terms of lifetime income, the Office of National Statistics (ONS) would expect a male to live for 17.3 years and he will have £8,027less over his lifetime. For a female she can expected to live for 20.4 years decreasing her income by £9,465. As annuity rates fall from their recent recovery highs are there alternatives? It is possible to take an income and delay buying an annuity using a flexible income plans. For a very low risk option a fixed term annuity terms of one year or more with an income selected by you and a guaranteed maturity amount at the end of the term. At the end of the term all open market options are available including an annuity from any provider, pension drawdown, taking the fund as cash or any other option available at that time. An alternative would be flexible drawdown that offers the greatest flexibility where an income or cash sums can be taken at any time and is accessible even with smaller funds from £30,000 or more.